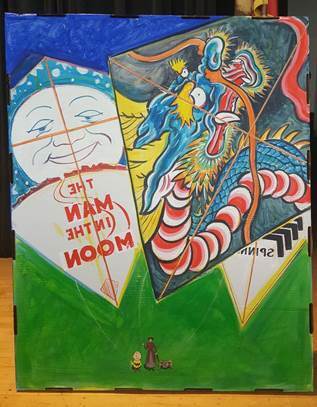 The picture above was painted by our decorations chair, Sam Ames, for our party night, “Let’s Go Fly a Kite!” Just about every month on our party night, Sam paints a masterpiece for us! Sam is an artist and taught art for many years at a college in Rhode Island. Thank you very much, Sam, for sharing your gift with us! Come see what he paints for our next party night! We are a singles’ square dance club in San Diego, California that welcomes singles, couples, families, and anyone else who wants to have a good time square dancing. We dance at the War Memorial Building in Balboa Park (north end of the Zoo parking lot, minutes from downtown San Diego). Scroll down to “OFFICERS/CONTACTS” if you need additional information about any of our activities, or to sign up for our newsletter. We hope you can join us! … enjoy them all, through Square Dancing! Enjoy the experience of dancing and moving to the music, even if you are not a great dancer! Dancing in teams builds strong bonds between people! A great place to meet and interact with other people! Exercise for both the body and mind! No experience necessary and no partner is required! If you want to learn more about square dancing in general, go to www.you2candance.com. If you would like to join one of our new dancer groups, you are most welcome! Tell your friends! We hope to see you! CLUB DANCE – Every Thursday evening. Call or email for the latest information. War Memorial Building, 3325 Zoo Drive, San Diego, CA 92101 (click the link above for Google Maps location and directions). · 6:30pm-8:00pm – New Dancer Group. Currently we are going through the Mainstream Program. Anyone who started a class in the fall of 2018 or earlier would be comfortable. Contact John Marus, our instructor, with any questions. · 8:00pm-9:30pm – Experienced Dancers’ Dance (Plus Square Dancing). On our second Thursday party nights, Milton Alexander will join us with rounds and easy line dances! · FEBRUARY 28 – Birthday Night -- Celebrating birthdays and anniversaries for the month with cake and ice cream! · MARCH 14 – Party Night – “Pi (π) and Potato Chips” – Come celebrate pi day with some sweet and salt. We will try to have 3.14 tips per hour. Rounds and line dances with Milton Alexander. · MARCH 28 – Birthday Night -- Celebrating birthdays and anniversaries for the month with cake and ice cream! · APRIL 11 – Party Night – “Quartet Day” – Who is going to come and sing with the caller? Rounds and line dances with Milton Alexander. · APRIL 18 – Birthday Night -- Celebrating birthdays and anniversaries for the month with cake and ice cream! · APRIL 25 – DARK – We are all going to the State Convention in Imperial. We hope to see you there! · MAY 9 – Party Night – “Mom’s Day” – Come honor that special person in your life. Rounds and line dances with Milton Alexander. · MAY 30 – Birthday Night -- Celebrating birthdays and anniversaries for the month with cake and ice cream!